In the third installment of the series, Bella is drawn closer to Edward and his vampire family as an army of newborns is getting ready to overtake Forts, Washington. Behind this army is the ever manipulative Victoria, the redheaded vampire who lost her lover James in Edward’s hands, who was trying to save Bella in the first movie of the series. The Volturi family is not doing anything to stop the attacks and ultimately give the Cullens an ultimatum to convert Bella or else. 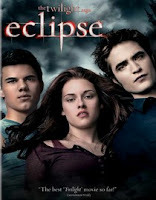 Jacob and his werewolves friends make a truce with the Cullens to defeat, together, the army of vampires. All the while, Edward proposes marriage to Bella, while Bella realizes that she has learned to also love Jacob. This film is darker in tone than the first two; there are battle scenes and violent confrontations, but no gore, so I guess that makes it bearable. Good movie; I enjoyed it a lot even though I’m not a teenager, but I find the story refreshing and engaging. I also liked the first two installments in this series. I can’t wait to see what happens next!